Here is a fan art poster for you to enjoy made by: AKFJeff @PugfatherJeff. Rowena returns in ep 7. J2M had a fun week of shooting this week. Misha said they were like children. "The director just gave up." Jack is having trouble with his vessel so he collapses. Scenes were filmed on a hospital set with Sam, Cas and Dean. Scenes were filmed by a river with Dean. Episode 7 synopsis from KsiteTV! Supernatural “Unhuman Nature” promo Photos: Rowena’s Back from KsiteTV! It’s a tearjerking hour, with scenes that will inspire a thousand tumblr gif sets, and I’d rank it as one of the top episodes of the season so far. In case you don’t remember, episode six ended with Jack (Alexander Calvert) collapsing with a distraught Dean (Jensen Ackles) by his side. 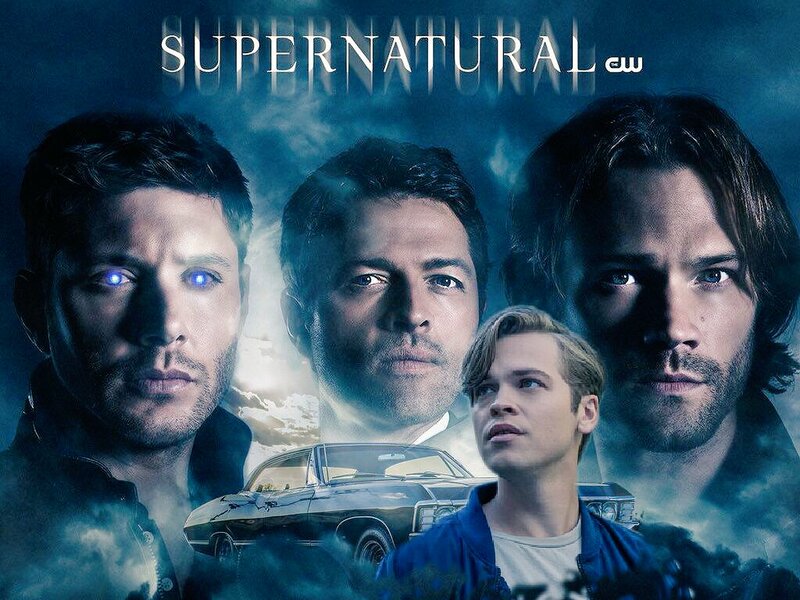 In “Unhuman Nature,” Dean joins with Jack’s other dads, Castiel (Misha Collins) and Sam (Jared Padalecki), to try to save the fading Nephilim, and it leads to some heavy stuff. Eugenie Ross-Leming, the other writer of the episode, enjoyed the emotional scenes: “I always like things where Dean gets to show a little bit of tenderness coming through.” That tenderness leads to some of the best scenes of the episode, where Dean lets Jack drive the Impala and bonds with this pseudo-son. When medicine doesn’t help Jack, the boys enlist the aid of our favorite red-headed witch, Rowena (Ruth Connell). Having been tortured by Lucifer twice, Rowena isn’t initially excited about helping Satan’s son. As you can see in the preview below for this week’s episode of SUPERNATURAL, Jack (Alex Calvert) is very ill and he declares “before my life is over, I want to live it.” That leads to a little road trip with Dean, but back in the bunker, Sam and Castiel have called in some help in the form of Rowena (Ruth Connell) to assist Jack with whatever is happening to him. During a recent celebration for SUPERNATURAL’s 300th episode, we spoke with both Calvert and Connell about this week’s episode. Finally, Nick’s continued existence in this world has plagued characters like Sam, Jack and Castiel, each of whom have terrible histories with Lucifer. Rowena bonded with Sam last year when she commiserated about how traumatized she is by Lucifer after he killed her. How might she react to meeting up with Nick? Connell didn’t tell us when or if that might happen, but she did say “I would love [to see that meeting]. I love [Mark] Pellegrino, we get along great. We do panels with each other at conventions now. He’s the squashiest bun of a man you’ve ever met. He does a Mickey Mouse impersonation and dances to Dancing Queen. So I love with Mark, he’s such a brilliant actor. I just love it as Ruth to work with Mark.” All of which is likely the opposite from how a meeting between Rowena and Nick might turn out. Episode 7 sneak peek! from CW. Supernatural Season 14 Episodes 7 Review & After Show Special quest star Ruth Connell!